The Baldricks that manage the NHS have formulated a cunning plan to defeat the Ebola virus by effectively bussing infected patients to literally every corner of Britain, Added to the Royal Free Hospital in London will be Royal Hallamshire Hospital in Sheffield, Royal Liverpool hospital and Royal Victoria Infirmary in Newcastle upon Tyne as the first of eventually upto 160 UK wide hospitals that Ebola patients will be disbursed across. 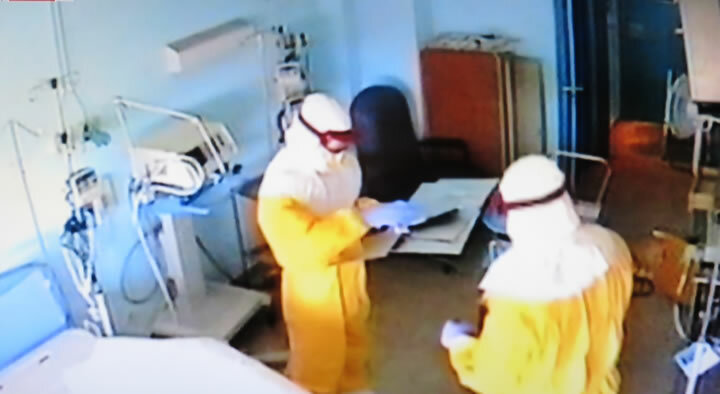 It appears that nothing is being learned from either West Africa or from far closer to home Spain where no matter what precautions are taken by medical staff the virus STILL SPREADS. After all the ongoing Spanish outbreak started at Spain’s most resourced hospital for dealing with Ebola but was still unable to prevent the virus spreading despite only treating 1 patient at the time! Instead Britain’s NHS Baldricks appear determined to create an healthcare catastrophe out of the Ebola crisis. This illustrates the fundamental flaw at the heart of public sector institutions such as the NHS, namely the myth of competency that surrounds the NHS where at least for 1/3rd of the time the public health services only tend to go through the motions of providing a health service which whilst most of the time the consequences for lack of consistency in competency is only to the detriment of the patient, however as we are witnessing in Spain that Ebola is completely unforgiving where any lack of competency can result in a disastrous outcome. The news of effectively creating a nationwide conduit for the efficient spread of Ebola nationwide is a recipe for disaster that only the likes of Baldrick could have come up with as cunning plan of coping with the virus that looks destined to backfire in spectacular style! Already the army of NHS Baldricks had been encouraging hundreds of NHS staff to fly out to West Africa, many of whom will become infected and flown back to the UK NHS hospitals to go on and infect others, as NHS hospitals will become breading grounds for the virus that the NHS is determined will be nationwide. The UK is primed for an Ebola pandemic due to inherent culture of putting patients second, for which the likes of Ebola will be very unforgiving as where Ebola is concerned time is of the essence for this highly infectious virus due to the 12 days or so that the patient is infectious upto the point of death and remains infectious even after death. A&E - Firstly it can take upto 6 hours to be seen in A&E and then there is a 50/50 risk that the symptoms would be dismissed and the patient sent home to further incubate the virus and spread the infection. GPs - It can usually take upto 1 week to be seen by your GP for flu like symptoms that Ebola would tend to exhibit in the earlier stages of infection. Hospital Referrals - It could take as long as 3 months to be referred to a specialist, many times the critical time period of 12 days that the virus can take to KILL the patient let alone infect many others. Especially as the NHS wants patients to first do the appointment dance i.e. GP refers, patient waits for a letter with password to log onto the NHS website to make an appointment, no appointments available so the patient has to go back to their GP, the result a month wasted. The government believing its own preparedness propaganda has compounded the potential for an UK Ebola crisis by instead of declaring it would stop all flights from affected countries during the current outbreak instead dicing with death complacently states that travellers from Sub-Saharan Africa will not even be checked for signs of infection which sows the seeds for a number of infected individuals to be allowed into the UK where only 1 would be necessary to mark Britain’s patient zero to start an outbreak, especially as free movement of people is enshrined in European union treaties no matter the risk they may pose in terms of spreading a virus i.e. an infected Spanish person could easily get on a plane and land in the UK without any checks of infection. The World Health Organisation estimates that the number of infected people in the effected countries is doubling every 3 weeks then it is highly probable that the UK will have its own out of control Ebola outbreaks before the end of this month (October), it's patient zero's that the NHS will disburse to all corners of Britain. 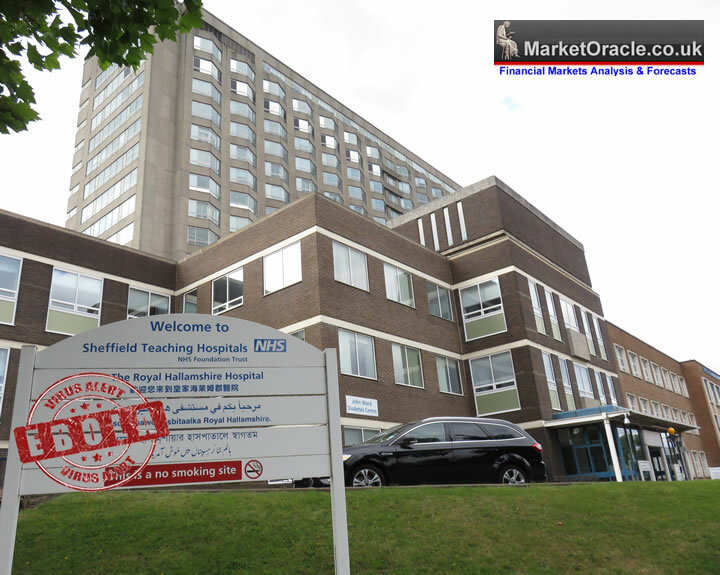 The fact that the infected patients will be disbursed nationwide and that NHS staff are barely competent 2/3rds of the time in handling such an outbreak then ALL NHS hospitals will become a no go zone which will result in a huge spike in the number of deaths not because of Ebola but because patients will rightly be too afraid to attend for instance Sheffield's Royal Hallamshire hospital, where patients could go in as day patients only to discover that days later they have been placed under quarantine and may and inadvertently infected their friends of families. Therefore as a matter of urgency someone competent needs to be put in charge of handling the potential risks of Ebola outbreaks in the UK where the first sign of intelligence would be in isolating and the concentration of Ebola patients so as reduce the risks of out of control outbreaks i.e. the exact opposite to today's NHS Baldrick plan of spreading the virus. Instead the baldrick's in charge of the NHS issue statements such as don't worry this is Britain, not Africa, and that there is only a very low risk of an outbreak in the UK. Well that is what the Spanish medical staff were stating just before they started dropping like flys! Someone competent needs to urgently take control and formulate a national emergency plan to contain Ebola outbreaks because the current NHS plans and people are not competent and in fact will magnify any outbreak rather than containment, and we will not get a second chance! And the big elephant in the room that no one is stating is that the virus may have mutated into a far more viralious form than in the past and therefore all of the plans and procedures on the basis of past outbreaks are insufficient to contain the virus! Infected patients in the UK should be quarantined in a central facility rather than be disbursed nationwide. Infected UK NHS staff in West Africa should be quarantined and treated in West Africa and not be flown back into the UK. Suspend flights from all countries where there is an out of control outbreak. Screen all passengers no matter from where they come. The bottom-line is that an outbreak in Britain is INEVITVABLE because our Borders agency and NHS are just not competent enough in preventing it, therefore we have a short window of opportunity to put efforts into developing a vaccine in enough quantities to make a difference. Your analyst fearing that come January we will be seen the military step in to collect and dispose of many hundreds of body bags across the UK, just as the US Military will be doing across the Atlantic whilst President Obola waffles on about the I.S. threat and how the U.S. needs to spend billions bombing Syria and Iraq and only millions combating Ebola.